My character for tonight’s murder party is a burglar. Costume – stripey jumper, swag bag, burglar mask. I have had no time to shop, so it’s a stripy jumper from the wardrobe stripy long-sleeved T from P’s wardrobe, a strange briefcase I got free from Viking once to have my “safe-cracking tools” in and – since I haven’t been to a costume shop, for the mask, I bought… a pair of tights. 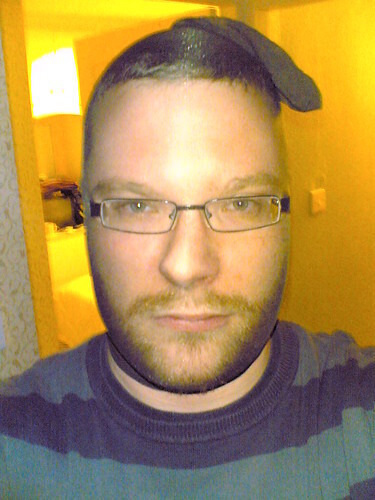 The stocking-over-the-head look is far more frightening than a comedy mask. Just one thing – even with a tight over my head, there’s no doubting it’s me. It doesn’t disguise me at all! Just as well I really wasn’t planning on holding anywhere up. P is going as a detective, so amongst the props I’ve bought him a Hamlet cigar. I just had to pop down to the Co-op for a pair of tights and a cigar. The guy on the till looked at me a bit strangely and said he hoped I’d have a really good night. I’ve been given the run of the house to myself, so I have been taking the opportunity to use the shiny new DVD player I got for Christmas – on a set of Spooks series 1 DVDs. I haven’t managed to see any of Spooks on the TV, so I’m coming to this very late. It’s really good. Very edgy with some unexpected plot-twists. And then, halfway through the series, enter Hugh Laurie as the MI6 agent. Is he there for light relief? It seems slightly jarring – after all the high drama, the intrigue, the unexpected and gruesome deaths, the deathly seriousness, then suddenly we have Laurie, almost in the character he used to have in Fry and Laurie. Hmmm. Just popped over to www.MI5.gov.uk -“Last updated 15.12.06 1000” – very reassuring. Hmm. And the site is available in Urdu, Arabic and Welsh. Eh? Pop over to MI6 – and that’s available in Spanish, Russian, French, Arabic and Chinese. In that order. No Welsh. EDIT 04:21 – Gordon Bennett, that’s such a cliff hanger to end a series on! Oh, dear, I’ve done it. I’ve ordered Wii. I’ve taken Leigh’s advice and given my credit card details to Gameplay – a bumper order for Wii, Wii Play, Zelda and Rabbids. At least when Leigh ordered, he had a count-down for Wii to arrive – I’ve no idea when they’ll fulfill the order! I can’t go near my computer without googling Wii, so I know there’s going to be Linerider for Wii (???) and you can even get a Wii WordPress plugin that reformats your blog so that you can read it (and post to it?) from Wii. Off to see my parents shortly – they’ve kindly agreed to meet me in a pub halfway between home and here so that we both get a reduced drive. The pub is in Droitwich, just off the motorway. The normal drive home takes about three hours, half of which is driving 2/3rds of the distance on the motorway, and then just as long driving fewer miles on twisty country roads. By meeting in Droitwich, my parents don’t have to do the motorway driving, which they don’t like, and I don’t have to do the twisty country roads, which I don’t get much practice of. Ideal! A colleague is having a New Year’s Eve murder party, rather like we will be, and mentioned in passing that she needed a gun. I have a gun, that’s just gathering dust at home, a toy, prop-gun I bought for a fancy dress party last year, so I promised to bring it in to work today to lend to her. She’s only part time, and I arrived today after I knew she would have left, so I called by her house to let her have it. I felt self conscious just crossing the road from the car to the house whilst packing heat and was then caught in a dilemma when no-one answered the door. Can I post a gun through the letterbox? Was I even sure I had the right house? Is knocking on someone’s door, whilst holding a gun, a good idea? Is it best to hold it openly, or to conceal it in one’s coat? Much later in the evening, colleague’s husband came to the office to discuss something else so I passed the gun to him to take home. I had to go back to my car to retrieve it, and by the time I got back, he was sitting in his car. Which meant I had to walk over with a gun in my hand and tap on the window. Good job he was expecting me. Actually carrying a gun is pretty strange to me. I’ve never shot a real one of any sort, and certainly never want to have to fire one in anger. I think it might be interesting to spend an afternoon in a rifle range somewhere to find out what shooting is like, but I’m pretty unlikely ever to hit a target. Despite never handling a real one, I know all about guns from US films and TV shows. I know how handle one, to clean it, never to point it at anyone; how to hold one together with a torch, how to pistol-whip someone. It’s amazing how a prop gun takes on a life when you pick it up. It’s fascinating what play-acting occurs to people when you give them a toy gun. In all the day I’ve had it, I’m really glad I didn’t bump into anyone who thought it was real, or who had to take a split-second decision on whether or not it was real. Someone’s trying to port Linux to the Wii! P has been off with friends all day, and he’s been Wiiing as well! It’s everywhere!